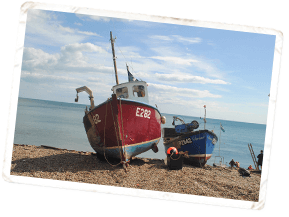 Collaboration between fishermen, conservationists, scientists and regulators in Lyme Bay has achieved a “win-win” model for fishing and conservation. The fishermen involved have experienced increased catches, improved landing infrastructure and a higher catch per unit of effort. They are now enjoying higher prices for their catch from a market that is prepared to pay more for traceable, sustainable and high-quality fish and shellfish. Research has shown that this has led to higher levels of job and income satisfaction and a desire by younger generations to enter the industry. These benefits for fishermen have gone hand in hand with a measurable revival of marine habitats, rare species and some commercially important stocks. Lyme Bay, on the south coast of England, is a marine biodiversity hotspot, containing important reef habitats that support a number of rare and threatened marine species. In 2008, 60 nautical square miles of the bay were closed to bottom towed fishing to protect the reefs and their rare corals and sea fans. The closure was implemented to allow benthic habitats to recover from damage sustained from fishing with mobile gear and the area was increased to 90 square miles in 2010. However, the removal of mobile gear resulted in a large increase in the use of static gears (pots and nets) which led to some fish stocks being overfished and impaired the ability for habitats to recover. To manage the changes that came with this designation, the Lyme Bay Fisheries and Conservation Reserve “the Reserve” Working Group was set up by Blue Marine Foundation “BLUE” in 2011 and was formally established as a Consultative Committee “Committee” in 2013. This Committee set out to achieve the establishment of a multiple use marine protected area where fishing is sustainable and well-managed, important habitats and features are protected and the fishing communities receive benefits from fishing responsibly. Currently, 42 boats in the Reserve operate under a memorandum of understanding and adhere to a voluntary code of conduct which complements the regional Inshore Fisheries and Conservation Authorities (IFCA) statutory regulation of the fishery. Fishermen restrict pots and nets to agreed levels in the interests of the environment and in line with conservation objectives. Fish handling facilities have been provided within each port, which includes chiller rooms and ice making equipment. These have been installed to improve the quality, shelf-life and consequent value of the landed catches for the fishermen. iVMS units on board all boats monitor where fishing occurs ensuring compliance with the scheme and BLUE has created the ‘Reserve Seafood’ brand, which markets the sustainable, premium quality, provenance-assured seafood caught by fishermen. All of this goes a long way towards the long-term sustainable future of Lyme Bay for both fish and fishermen. Monitoring studies have been conducted in the area since 2008 by the University of Plymouth Marine Institute in partnership with the fishermen and regional Inshore Fisheries and Conservation Authorities (IFCAs) and these are showing that reefs and fish stocks are recovering. An annual potting study – a first of its kind in the UK, commissioned by DEFRA and carried out by PUMI has monitored levels of potting within the Reserve since 2013. As a combined result of the ban on mobile gear and the collaborative approach introduced by BLUE, there has been a four-fold increase in the number of reef species since 2008, a doubling of scallop landings, a quadrupling of juvenile lobsters and a two and a half times increase in landings of brown crabs. The evidence gathered on the ecological health of the Reserve has proved invaluable to both regulators and fishers and helped make more informed management decisions. Equally, robust fishing data helps fishers to argue their corner when there is disagreement about management measures. The overall result is better decision-making, buy-in from fishers and local stakeholders and an established forum for discussion and debate. The model has stimulated huge interest from other fisheries around the UK as well as further afield, placing it at the forefront of delivering a best-practice approach. Southern IFCA (SIFCA) have said that the Reserve is the UK flagship for MPAs and its success both for the environment and for fishing communities gives optimism for other MPA projects around the UK and abroad. BLUE is confident that the Reserve is a template for sustainable fishing in the UK’s inshore waters, not only in the protected areas, but in other areas that choose to adopt a similar approach.